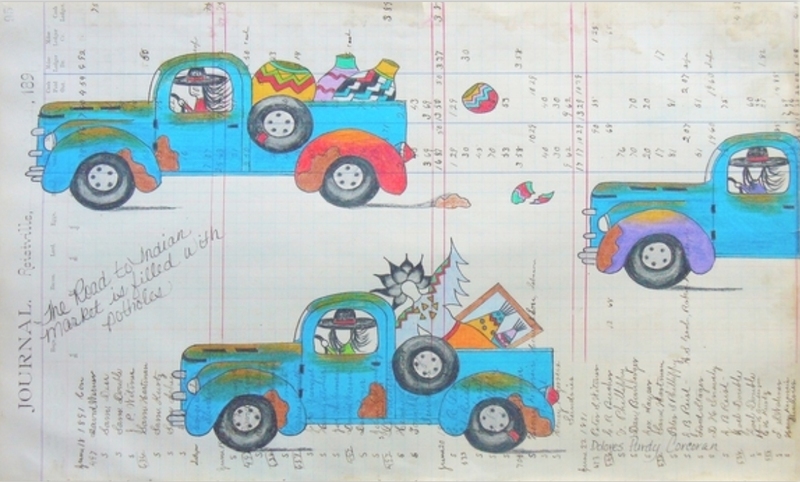 This contemporary drawing entitled "The Road to Indian Market is Filled with Potholes” by Dolores Purdy Corcoran (2012), is part of a new TBH lesson plan, correlated to the Schild Ledger Collection, that examines how ledger art was, and is still is, an important medium of expression for Native Americans. The lesson, "Drawing our Lives: Plains Ledger Art Revisited," was written by TBH Education Advisor Carol Schlenk. Oriented to 7th-grade students, the lesson contatins a variety of primary documents to aid students in understanding Plains Indian history. Image courtesy of the artist.